Breakfast is the most important meal of the day, don't you know? Who are we kidding, of course you knew, you’re no idiot. Given the importance of this meal, you really should only be eating the best of the best, which is where we come in with this nifty little list of Brisbane’s best breakfasts for 2016. From bagels to benedict and waffles to wilted spinach we’re covering all our bases here. Collective Kitchen and Bar, in the CBD put on a mean breakfast spread, that’s for sure. We’re big, big fans of their pea and feta smash with crispy halloumi and cherry vine tomatoes. But, we’re equally as smitten with the tomato braised chorizo dished up with bacon, white beans, parmesan, poached eggs and vinocotta all piled up on toasted sourdough. It’s pretty bloody delicious, if you ask us. The Rising Sun breakfast burger at Clayfield Seafood Market may be the only breakfast item on the menu, but it’s a damn good one at that. The aptly named burger comes with grilled bacon and egg, smoky BBQ aioli, oozy melted cheese, grilled onion and hollandaise stacked between a perfectly toasted bun. The Brass Barrel, in Rosalie makes the cut onto the list of Brisbane’s best breakfasts for a few reasons. The important one being their eggs benny. It comes complete with pulled pork and Sriracha hollandaise. 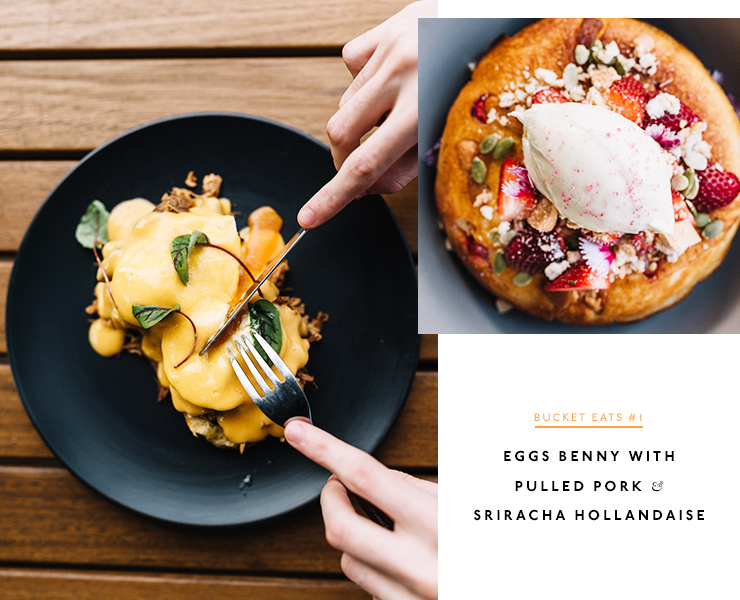 If savoury breakfasts aren’t quite your thing, don’t freak out: there’s also a strawberry shortcake hotcake (read: gigantic delicious pancake) that will satisfy the sweetest of tooths. 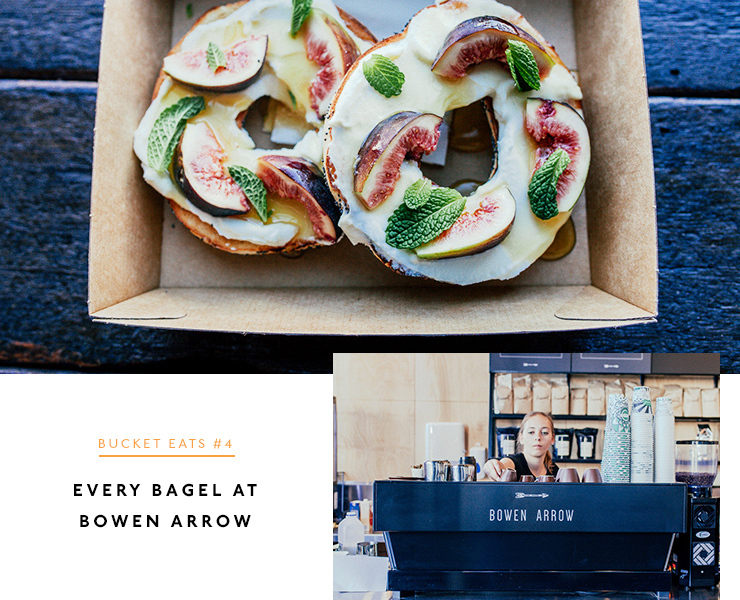 Bowen Arrow, in Bowen Hills, do a seriously great breakfast. Their bagels, for a start, will change your life. Not just with how good they taste, but with how beautifully presented they are. If we had to pick just one though, we’d say go for the vego bagel: Portobello mushroom, sliced tomato, smashed avo, spinach, parmesan and a balsamic glaze. Oh boy. They also do all of the other classics very, very well. Ok Brisbane, if you haven’t had breakfast at River Bar & Kitchen yet, what are you doing? It’s the perfect place to stop for a perfectly smug breakfast after traipsing up and down the river in your active wear. Or, the perfect place to stop in if you’re hungry. Either or, really. Their menu is seasonal, so you’ll never have the same thing twice. For winter though, we’re loving their classic eggs benny and their mascarpone pancakes. If there’s one thing we love in life, it’s a good pun. As you’re aware, we also love breakfast, so when a cacophony of puns and a delicious menu join forces we get pretty excited. Hence Let Minnow landing a place on this list. Plus, OMG, it’s an all-day breakfast menu too. The jumbo jaffles are going to change your life. Yes, there is a jumbo chicken parmy jaffle and yes, it’s the best. And no, we won’t judge you if you order it for breakfast. Also, guys, there’s a whole section on their menu dedicated to potato cakes so prepare your body for that, too. This hidden gem—not anymore, soz locals—sits in the leafy back streets of Moorooka, so we'll forgive you if you’ve never heard of it. You’ll be pleasantly surprised by their modern, edgy menu, though. Not just satisfied by a standard menu, these guys do pretty epic specials for breakfast. We’re still reminiscing on the time Todd & Pupp brought out ramen for breakfast, or the other time they did croque madame. If you ever find yourself in the Valley in need of a quick breakfast, you’d better hot foot it to kiosk. in Bakery Lane. This hole in the wall spot has an ever changing menu that is pretty ideal for a snack on the way to work without sacrificing your dignity for a servo breakfast. Lost Boys is kind of essential if you’re a vegetarian or vegan in Brisbane. These guys do an entirely meat-free menu which means you can enjoy breakfast guilt free—hooray! 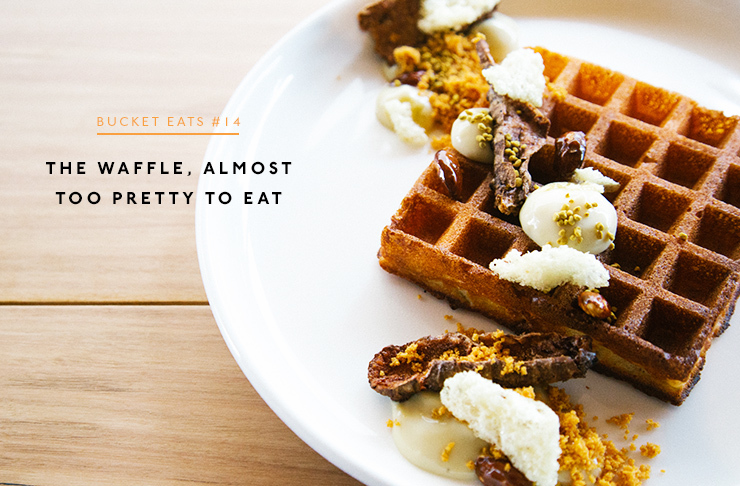 Our pick is the vegan waffles with grilled pear, crystalised ginger, coconut ice cream and pistachio praline. Plus, just a general PSA, you can find a fully vego big breakfast here. Gerard’s Bistro does, according to some, one of the best breakfasts in Brisbane. We’ll let you make that call for yourself, but trust us when we say it’s a 10/10. The GB breakfast muffin with merguez, taklia, egg and cheese is the grown up answer to a certain fast food breakfast muffin which is definitely not on this list. The Baghdad eggs though, you guys, they’re pretty special: eggs fried in cumin, garlic, mint and lemon on flatbread with tahini yogurt. Brisbane breakfast bliss. South Brisbane’s Merriweather Café is a Brisbane breakfast mainstay. We’re so obsessed with their crumpets that’s it’s unhealthy. These guys grow a lot of their produce in their onsite garden which is why it tastes better. There’s also a dog that hangs out here all the time, which is obviously great. 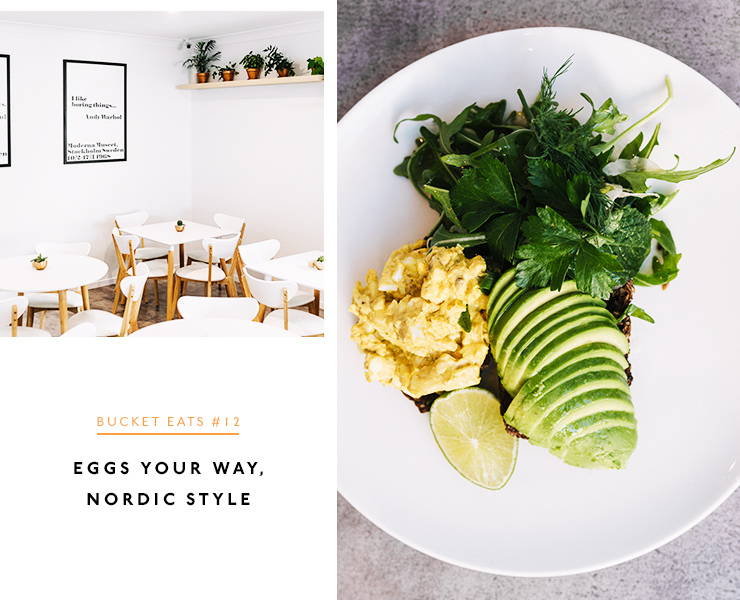 This Nordic eatery in West End does modern, seasonal breakfasts that are perfectly divided into light and substantial sections. The Nordic are just so organised. 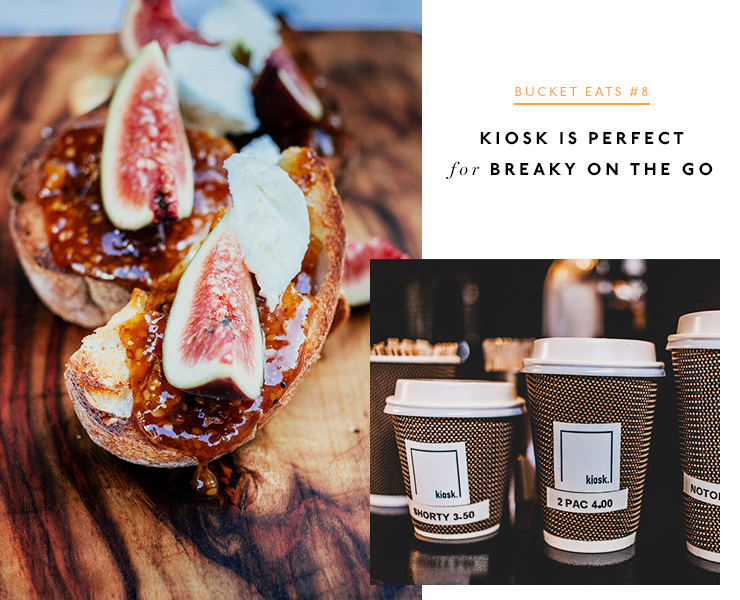 For something different that isn’t just eggs and toast Lokal + Co is your spot. The roasted cauliflower and spiced spinach lentils with Lefse breads and coconut sambol is such a refreshing addition to the Brisbane breakfast scene, likewise the braised pork belly with kimchi and crispy fried egg. If you’re a bit of a traditionalist though, there’s also eggs your way and of course, and champagne after 10am. Ben’s Burgers have probably already cemented their place on your top 3 burger list, but if you haven’t tried their breakfast burgers you simply haven’t lived. Fact. The spicy sauce will change you and you’ll never be able to face another breakfast burger again. Seven South is breathing new life into the Southside’s breakfast scene. The fried potato and parmesan hotcakes with avocado aioli, pumpkin hummus and poached eggs with bacon is one of our fave breakfast dishes of all time. It’s that great. Plus, the ricotta hotcakes are crazy good, too. Classic really is best at Botero in the CBD. Take their crushed green peas and broad beans on toast with poached egg, za’atar and smoked pancetta for example, or their gingerbread hotcakes with roasted rhubarb and honey comb. After winning big at the Good Food Awards, it’s only right that these guys are on our list of best breakfasts in Brisbane Gauge's brioche pudding with corella pear, buffalo ricotta, and pepper berry will change your life while the ash sour dough, almond cream, raw beef with XO style sauce and soft egg. Any Brisbane breakfast that offers charred WA octopus with pickled beetroot as a side is a winner in our eyes. Cheese for breakfast is always, always a good idea. Always. So it’s really no surprise that Fromage The Cow is on this list of essential Brisbane breakfasts. The brie en cocotte baked with pumpkin, morcilla, eggs and sourdough is the perfect way to start the day. The Irish Rarebit (cheddar melted on toast with Guinness) is one of our stand out breakfasts, and this one comes with poached eggs, tarragon mayo and tomato salsa. Not technically in Brisbane, Homage Restaurant is way too good to be left of this list for the sake of geography. The local produce is dished up in a way that is pretty much an art form, and is all kinds of delicious. Our go-to is the Mulgowie sweet corn fritter with smocked hock or the French toast with lemon curd.